Have you already pre-ordered your copy of Super Mario Odyssey? It’s not too late to pre-order to get that sweet Amazon discount. This is going to be the first full open-world Mario game since Super Mario Sunshine was release on the Gamecube in 2002. Overall, the buzz seems to be pretty positive for the most part. The Legend of Zelda: Breath of the Wild blazed a path on the Nintendo Switch with the massive landscapes, story and world. So far it seems like Odyssey is up to the task, and just might be following that up with it’s own spin, and the charm we’ve come to love in modern Mario games. After 15 years, a spectacular Mario open-world platformer is far overdue if you ask us. Most of that were kids when Sunshine came out are now adults with jobs, and real responsibilities, and dare I say it? Kids of our own! Though it’s not as grave as it seems. Bringing Mario into a whole new generation with a stellar game is exactly what Nintendo needs to do right now. Give something to the old fans like us, give something to the even older fans, and also bring something to engage the youngins. It’s very interesting to see how deeply set Super Mario games are set in popular culture. As we saw with the massive success of the NES and SNES Classic, Nintendo and Mario are deeply rooted into the hearts and minds of many generations of gamer. It’s going to be interesting to see if the Switch and Odyssey are one of the things in 20 years time that people feel nostalgic about. Nostalgic enough to wait in long lines, and drop large amounts of cash on at the drop of a…red hat. I personally am very interested to see what sticks and what doesn’t in 20 years time. Will there ever be another NES or SNES that really captivates the hearts of players or is that a time long gone in an industry that moves so fast in can hardly keep up with the attention spans of its players? Can’t say for sure right now, but it will surely be interesting to see when the time comes. Nintendo just announced and displayed a trailer, which you can watch below, for the new Super Mario Odyssey which takes Mario on a global adventure. 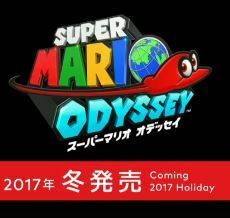 Will this be the invigorating vacation Mario needs? Probably not. But here’s hoping it’s a great game anyway. The Switch comes to us March 3rd, Super Mario Odyssey comes to us some time during the holidays later this year. Stick to Nerd Hall for more video game news as we get it.